Head In Knots: Read This: Is Everyone Hanging out Without Me? Read This: Is Everyone Hanging out Without Me? I know have written a few times about how I wish I had to talent to make seemingly ordinary things read like they are extraordinary. I know this happened when I read I was Told There'd be Cake. 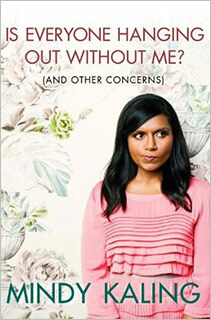 When I saw Mindy Kaling was coming out with a book, I was pretty excited. She seems like a pretty normal person, despite the fact that her character in The Office is an outward expression, it seems, of all the parts of our personalities we try to keep hidden. She's a writer, not a glamour-puss...generally seems cool. After reading this book, I am even more convinced of that. At times I was in hysterics (one of those times I was in an airport shuttle on my way to Disneyland...I am sure the older couple in the van with me thought I was cray), at times wondering how she was writing about my own life, and the rest trying to come up with a plan on how we could get her in my group of friends*. There is an authenticity in this book that I don't often see. Kaling lays it all out there...from pictures of her as a youth with rather unfortunate haircuts and clothing, to the truth behind heartbreak, to her complete lack of ability to pull the most important of moves -- the Irish Goodbye. She also talks quite a bit about her early struggles as an actor and writer, with no sugar coating or rosy endings (I guess...except that her career turned out rather rosy, but she definitely had to work for it). Even the title is a question we don't like to admit we ask ourselves, but often do. I was truly sad when this book ended...and again wondering if there was any way to make my life sound this interesting,. * my friend A agrees that she would fit right in with us...at some point we'll figure out how to make it happen.